The panel will be created and invites are sent as soon as you publish the conversation. There's no RSVP waiting period or scheduled date and time. The panel conversation is instantly live and panelists can accept (or decline) and start posting in it at their leisure. Yeah. I've done some of the panels and I usually planned them in advance via email, set a time for it to start, and then they get their invites. Here are a few more. We're looking to hire someone(s) to help us kickstart panels because I swear they have enormous potential. We're looking to hire someone(s) to help us kickstart panels because I swear they have enormous potential. Question: How do I make sure that this is an amazingly positive experience for the panelists? I’ve gotten a few yeses already from my panelists. Although I wrote a small book on using online math games with students on the spectrum, my panelists are heavy hitters who have appeared in major news publications and at national conferences, who are successful authors and game inventors, and who are genuinely amazing people who I want to do right by them with the panel. They are also reading this thread so any suggestions you can provide for me or for them is much appreciated. 1. The word panel conjures being in front of a camera with a live feed of video. A few of our panelists were initially thrown by the idea of panels being like this post — text with optional embeds like photos, links and YouTube videos. 3. The 50,000' view is the internet is the only venue on earth where there is an expectation that anyone can join the conversation. It's very powerful for giving voice to movements like MeToo. The trouble is it can also give voice to Nazis, trolls,& noise. In the physical world we've had amazing success with panels for centuries because the expectation of the audience is we all benefit by letting the panel speak. It's how millions of us hear from amazing people and get great signal in a noisy world. Cake panels remove the requirement of having cameras, a sound system, a stage, an auditorium or to be in the same place at the same time. They are public for anyone to read by simply sharing a link, and they're discoverable by searching Google.. The audience is unlimited. They can also extend over time. Perhaps a group of climbers will let us follow their expeditions on Cake panels one day. Good luck! I can't wait to see this panel. I read The Reason I Jump by Naoki Higashida and loved it. You should say you're on boarding someone soon to help with panels! Cake. I’m assuming that followers of this topic would like to be informed of new panels. Entertainment. We used entertainment on a previous conversation about recreational maths and magic. I would remove the "Cake" topic. The "Cake" topic is for conversations about Cake, not just conversations that are on Cake (that would be every conversation! 😄). So unless your panel is specifically discussing Cake, it's not a relevant topic. People who are interested in seeing conversations (including panels) about math or education are more likely to follow the "mathematics" and "education" topics than the "Cake" topic. 1. Get an email with an invitation. 2. View the panel conversation. 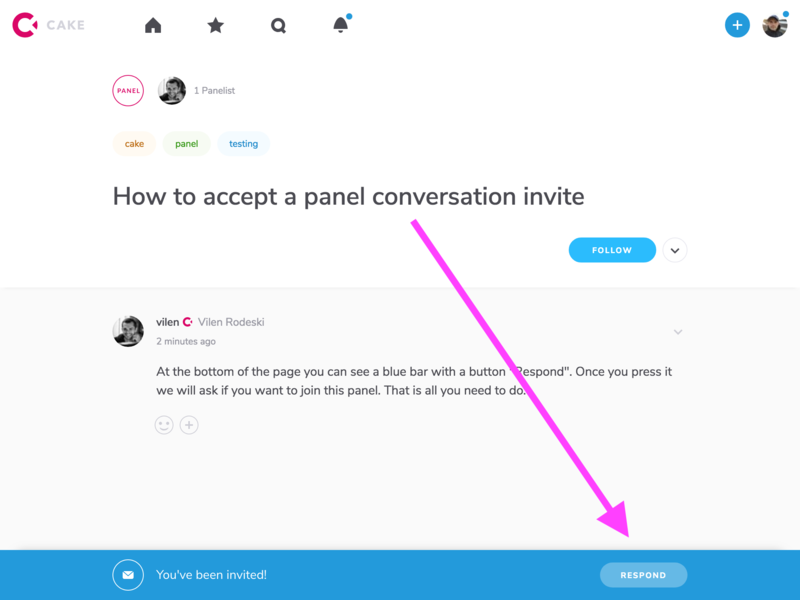 Click the button in the email to see the panel and accept the invitation if they choose. Thanks for chiming in to help make my panel an amazing experience for everyone! It was an incredible panel. I have friends and family commenting on it. I will tweet it out tomorrow. Thanks so much!